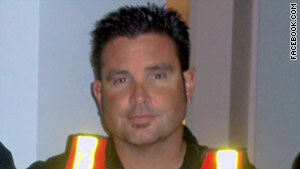 San Francisco Giants fan Bryan Stow was attacked as he left the parking lot of the Los Angeles Dodgers on March 31. Los Angeles (CNN) -- Cardinal Roger Mahony visited Bryan Stow Tuesday to pray for the 42-year-old, who remains in a medically induced coma nearly two weeks after he was attacked after a baseball game between the Los Angeles Dodgers and San Francisco Giants, a hospital spokeswoman said. Relatives of the Giants fan launched a website -- www.support4bryanstow.com -- in part to provide daily updates on his condition. Stow's sister, Bonnie Stow, told CNN that one priority of the neurosurgeons is keeping him sedated to prevent seizures and swelling in the brain. In a recent Web posting, she wrote: "The doctors want to limit visitors, noise and physical contact with Bryan. They're wanting to keep his brain calm and just ... quiet ... to see how that works. ... That way the neurologists can get a better reading of brain activity. Fever down." Bonnie Stow said her brother's seizures have subsided, and over the next 24 to 48 hours doctors want to gradually reduce the sedation he is under and, hopefully, bring him out of the medically induced coma. "We can't wait for Bryan to wake up so he can see for himself just how much people love him, whether they are family, friends or strangers." Since the unprovoked attack after the March 31 game at Dodger Stadium, money has poured in from numerous donors and fundraising events to help pay for medical costs and provide support for his two young children. Bonnie Stow said the website also identifies fundraising activity endorsed by Stow's family. "We are trying to post only legitimate fundraisers that we can confirm because unfortunately there are those trying to take advantage of this tragic situation," said Bonnie in a posting. At a dual fundraiser Monday at Dodger Stadium and AT&T Park in San Francisco, where the Giants and Dodgers played Monday, more than $120,000 was raised, said American Medical Response spokesman Jason Sorrick. More than $200,000 has been raised for Stow, who works for AMR. Meanwhile, investigators continued their search for the two suspected assailants, who fled after the beating in a light-colored, four-door car driven by a woman with a young boy inside, authorities said. Since the release of composite sketches, police have investigated more than 100 clues based on calls and tips, said Los Angeles Police Detective PJ Morris. About 100 witnesses saw Stow attacked as he left the stadium parking lot, and Morris said some of them have provided useful information. Officials are offering a $100,000 reward for information leading to arrests and convictions. "Whether it's the reward money or a Good Samaritan who wants to help solve a horrific crime, there has been a tremendous outpouring of calls from people who might have useful information," Morris said. Morris said detectives have compiled and presented photographic lineups of possible suspects to witnesses in the Los Angeles area but no one has identified Stow's attackers. Another team of detectives has been showing the photos to witnesses in the Bay Area. "Every call and tip is helpful in some capacity, even if it eliminates someone who may resemble the composite sketches," Morris said. "There is no forensic evidence in this case, therefore that person who comes forward is most likely how we're going to solve this thing." LAPD officials released a tip line for anyone with information: 1-800-222-TIPS (8477).